High Resolution Systems has launched a new website for HRS Control with increased features and improved functionality. 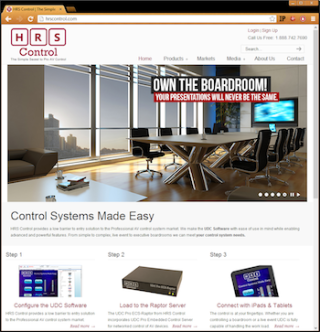 The new home page presents a graphical slideshow that demonstrates the company’s dedication to 'control systems made easy' for applications ranging from live events to executive boardrooms. Below the slideshow, a three-step process reveals how to configure UDC software, load it to the new Raptor server, and connect with iPads and popular tablets. Click on any step to learn more about the procedures. Section heads direct customers to information about the company, its equipment, and users. “Products” provides details about more than a dozen categories of gear. “Markets” spotlights customers in rental and staging, broadcast, live events, corporate boardrooms, military and government, trade shows, and houses of worship. “Media” relates customer stories and shares recent press releases. Videos offer info on product demos, HRS Control’s presence at trade shows, and training. “About Us” tells the HRS story from its founding. Customers can sign up for an account and, once approved, log in to the website to download UDC and other software to test and use. Users can also log in and download all of HRS Control’s revamped manuals and Quickstart guides. A new section gives resellers worldwide increased support with access to downloads of logos and marketing and press materials to aid their sales efforts.